« What’s better than people augmented by technology at meetings? What does that mean and how do I do it? Read on! How many conferences have you attended where you mostly meet someone interesting by chance? When you’re with colleagues, you hang out together because everyone else is a stranger. When you don’t really know anyone, you talk to the people you’re sitting next to at meals and hope they’ll be interesting. Have you ever wondered whether someone whom would be really great to meet is sitting three chairs away from you during a session or lunch? Well, you’ll never find out at a typical conference, and you won’t get to meet them. In addition, think about all that time spent talking to people with whom you have little in common. You’re searching for useful connections, solutions to professional challenges — but the conference provides no support for discovering and connecting with the most important resources in the room: the other interesting participants with the background and answers you want and need. It doesn’t have to be this way. Here’s what I do that greatly improves the conference for everyone. Immediately after welcome and housekeeping announcements I run one or more roundtables that use The Three Questions, allowing participants to learn about each other, share what they would like to learn and discuss, and proffer their relevant expertise and experience. This single opening exercise, which takes between thirty minutes and two hours depending on the conference size and duration, is the most important component of creating a meeting that really matters. 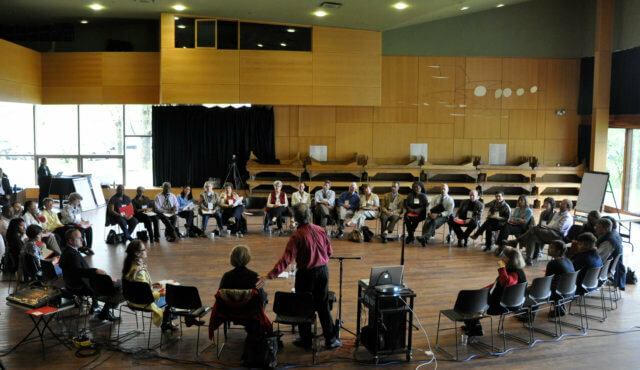 A meeting that makes possible the learning, connection, engagement, and outcomes that stakeholders and participants want. Providing this safe discovery process allows each person to get immediate answers to the core questions that they want and need to know about the other participants. If there are people in your roundtable you’d like to meet, you’ll find out who they are. You’ll hear the wealth of topics and issues that are on participants’ minds, including great new ideas. You’ll discover the people in the room who can be valuable resources for you: people with experience and expertise to help you with your current challenges, and people who are interested in exploring or collaborating on common interests you find you share. And finally you may well discover (to your surprise) that you are a valuable resource for other participants! When the roundtables are over, you will have something that typical conferences never supply: key information about the people present that provides a fantastic introduction to the participants, current challenges, opportunities, and resources in the room. You then have the rest of the conference to take advantage of everything you’ve learned. There’s nothing I’ve described that can’t also be done through painstaking conversation with the strangers around you at an event. What three-question roundtables do so well is supply and support a simple process that makes this discovery efficient, and comprehensive. Your participants will share and receive the information they need to make the conference that follows maximally effective for them. And they will appreciate that! Want to transform your next conference by facilitating early discovery? The full nitty-gritty details of how to prepare for and run three-question roundtables can be found in my book The Power of Participation: Creating Conferences That Deliver Learning, Connection, Engagement, and Action. Or experience the power of a roundtable yourself (and many more ways to significantly improve your conferences) by attending one of my Participate! workshops. This entry was posted on Monday, February 12th, 2018 at 5:15 am	and is filed under Event design. You can follow any responses to this entry through the RSS 2.0 feed.You can leave a response, or trackback from your own site.